Our dentists are skilled in techniques to restore your smile. All of the porcelain dental crowns at East Perth Dental Centre are domestically made, right here by technicians in Australia. 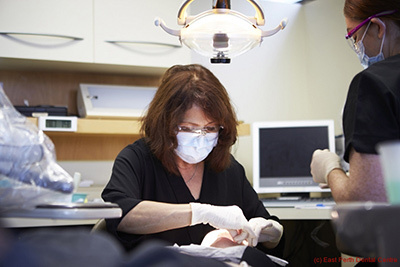 Doing so allows our East Perth family dentists to provide the highest quality of care to the patients that we serve. Modern porcelain crowns eliminate the grey line (or “blue halo”) along your gumlines, for natural-looking restorations that strengthen your teeth. In fact, they may even be mistaken as real teeth. A custom crown can preserve your tooth so that it doesn’t need to be extracted, allowing it to continue functioning for years to come. Our East Perth practice utilises CEREC technology to create single visit crowns that are made right here in our building. Each one is created with computer-generated imaging techniques for an accurate fit. Contact us today to find out how one of our Australian-made or single-visit crowns can help you smile with confidence again. Same-day treatment is available and we’re an in-network provider with most insurance plans.